Soak up the relaxed atmosphere at the “Ellmauer Summer Night” every Thursday at 6 pm. Experience traditional craft demonstrations and local folk music bands. You can also enjoy local culinary specialities such as traditional donuts, dumplings, sausages, cheese, and of course schnapps. 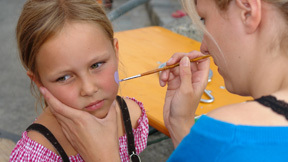 With attractions for children and free admission the “Ellmauer Summer night” is a must for the whole family. Every Wednesday at 6 pm Söll’s residents get together in the town center pedestrian zone to celebrate its traditions, its culture and its way of life! Program highlights include: local craftsmen and handcrafted folk art, various musicians and bands, shops and gifts, kids program with pony and tractor rides, as well as culinary highlights to suit every taste. 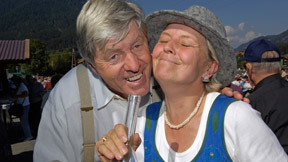 In Scheffau every Thursday at 7.30 pm is the Scheffauer village evening. A cosy get-together directly below the church in the very heart of the village with magnificent views of the Wilder Kaiser. 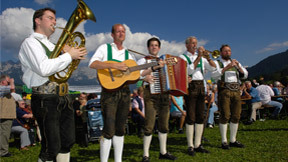 Stalls with local culinary specialities, and a parade and open-air concert from the Scheffau-Brass Band. Entrance is free of charge. Every summer around 100 traditional craftsmen and artists display their work on the Going town square. These specialised Tyrolean handcrafts range from the nearly extinct art of “Pylon” driving, wooden pipe drilling, and hand weaving & spinning to others that have stood the test of time and are regaining their popularity. Kassettl (native costume) making, wood carving and tatting are just a few examples. The local farmers are only too willing to show off their home-grown products and home cooked specialities. With attractions for children (incl. 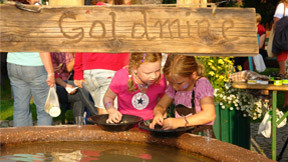 a kids gold mine) and free admission the “Kunstmarkt” is a holiday hit.